Carice van Houten as the Red Woman and Kit Harington as Jon Snow in GoT‘s Season 6, episode 2. Photo Credit: Helen Sloan/courtesy of HBO. Theon “Reek” Greyjoy (Alfie Allen) bailed. Arya Stark (Maisie Williams) caught a break. Tyrion Lannister (Peter Dinklage) freed some dragons. Balon Greyjoy (Patrick Malahide) tumbled off a bridge. Bran Stark (Isaac Hempstead Wright) is back — oh, and Ramsay Bolton (Iwan Rheon) killed his dad. But we don’t care about any of that because Jon Snow (Kit Harington) is alive. The Lord Commander inevitably jolted awake at the end of the episode after a months-long fake-out, not to mention bogus remarks from Kit Harington (“Sorry!” he says). Lady Melisandre may be old and feeble, as it was revealed last week, but she’s still got game. Apparently all it takes is a haircut (oh my, there goes Harington’s precious hair! ), a bath and some lying of hands to resurrect the dead — not that she’s aware because besides Ghost, we’re alone in knowing he’s alive. What’s more, she said — wait for it — “Please.” Melisandre may have desperately asked nicely but she, Ser Davos (Liam Cunningham), Tormund Giantsbane (Kristofer Hivju) and company didn’t believe it worked. Everyone else may have left the room, but for us the non-mysterious mystery is finally over. Jon’s death upset audiences last season to the point that it blew up social media with remarks like: “I’m starting to believe the hidden purpose of #GoT is to kill all characters and then its viewers, too” and “Game of Thrones should win an Emmy for THE MEANEST HOUR OF TELEVISION EVER CONCEIVED.” But with months to think it over and many open-ended questions (his mother and the White Walker teaser battle), it was obvious that he had to come back. Kit Harington as Jon Snow in GoT‘s Season 6, episode 2. Photo Credit: HBO. Of course, now we have more intriguing questions with unobvious answers: What will Jon be like now? Will he be another Beric Dondarrion who loses part of himself each time he comes back? 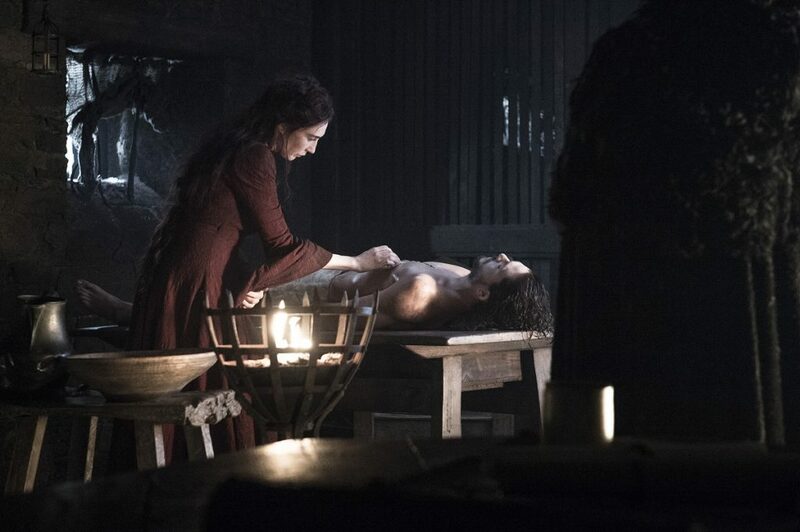 Can Melisandre revive him whenever convenient as Thoros of Myr did for Beric (he’s on his seventh life at last count)? The latter seems doubtful, if for any reason other than after Jon’s Christ-like resurrection people will likely think twice before killing him. Except for Ramsay, who already has plans to storm Castle Black and kill Jon Snow (he’s a little late to the party…). After stabbing his dad, Roose (Michael McElhatton), and killing his stepmother and minutes-old baby brother a la hounds — Myranda apparently wasn’t enough to satiate them — Ramsay is firm on eliminating anyone else with a possible claim to Winterfell and the North. But if Jon is key to uniting the Wildlings and the Night’s Watch, then maniacal Ramsay doesn’t stand a chance (especially if Wun Wun, portrayed by Ian Whyte, smashes him like he did that petty archer). 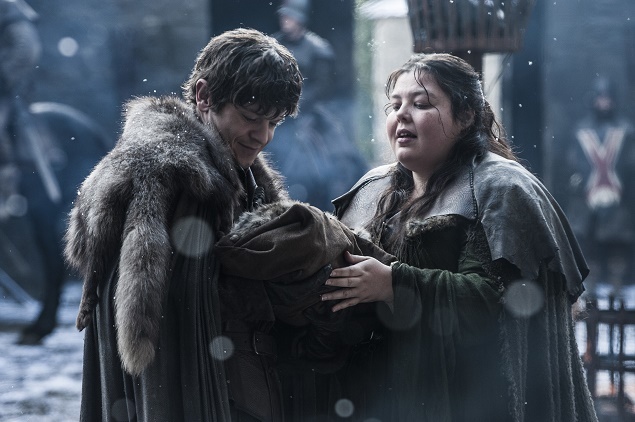 Pictured: Iwan Rheon as Ramsay Bolton with his baby brother and stepmother, portrayed by Elizabeth Webster, in GoT. Photo Credit: Helen Sloan/courtesy of HBO. Like Jon’s revival, Ramsay’s underhand plan to become Lord Bolton was expected, and these cruel murders are just the latest (and surely not last) in his string of treachery. 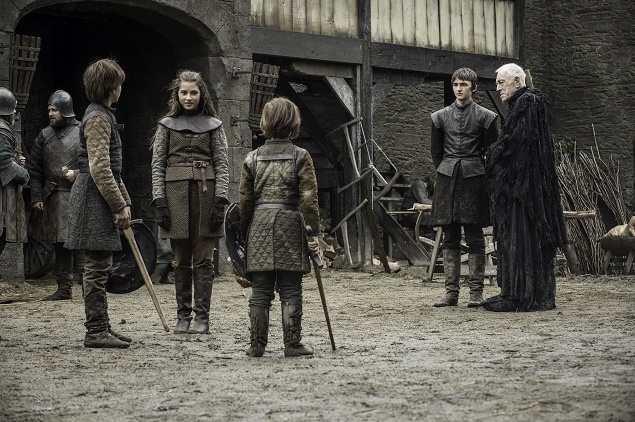 But as Roose warned, “If you act like a mad dog, you’ll be treated like a mad dog.” I wonder if everyone else besides the Karstarks will welcome Ramsay’s rule with open arms? I probably can’t say that of Euron Greyjoy (Pilou Asbaek). He doesn’t even like his own brother, Balon, king of the Ironborn and Theon’s father, who he threw off a wooden bridge. As awful as Balon was (the few times we did see him), his death was upsetting to his daughter, Yara (Gemma Whelan). “I’m going to find out who did this. I’m going to feed them to the sharks while they live,” she says. Perhaps the person she should blame is the Lord of Light; after all, if you remember in Season 3, Melisandre’s leeches promised the demise of self-declared king Balon (and Joffrey Baratheon and Robb Stark). Cheer up, Melisandre; you’re having a great week! Euron, hopefully, will add some intrigue into the mix — besides that time Yara and company tried to save Theon from Ramsay’s clutches, the Iron Islands subplot has been subpar in winning our affection. It looks like Yara might not be next in line for the throne after all with her uncle now back in town and with “Reek” coming home. Pictured: Actors Sebastian Croft, Cordelia Hill, Matteo Elezi, Isaac Hempstead Wright and Max von Sydow in GoT. Photo Credit: Helen Sloan/ courtesy of HBO. Sam Coleman as a young Hodor in GoT. Photo Credit: Helen Sloan/ courtesy of HBO. For the first time since Season 4, Bran is back, appearing mostly in a vision of a happier Winterfell. 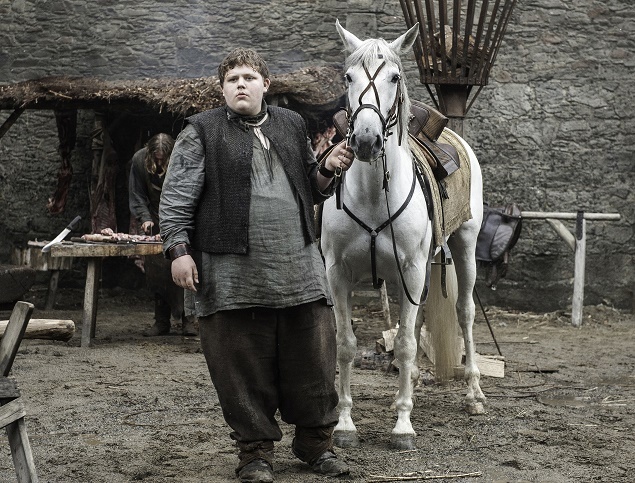 Meera Reed (Ellie Kendrick) may think his visions with the Three-Eyed Raven (Max von Sydow) are worthless, but they did teach us some things: Hodor (Kristian Nairn) used to be named Wyllis, and he could talk! Also, we saw Lyanna Stark, who will likely play a significant role moving forward (I’m still holding out hope that L+R=J). South of Bran and his magical tree, Arya was nameless enough to earn some food and a place to sleep, and Tyrion (stupidly?) freed Daenerys Targaryen’s (Emilia Clarke) dragons, Viserion and Rhaegal. “Next time I have an idea like that, punch me in the face,” he told Lord Varys (Conleth Hill). The dragons may have just been feeling friendly (which is unlikely since they haven’t been eating) but they were suspiciously very nice to Tyrion. His backstory and fascination with dragons since childhood may be the first hint at a greater role Tyrion (Targaryen?) will play. All in all, I didn’t mind this episode. Jon coming back was the only real thrill it delivered — and it’s nice when Game of Thrones lets something good happen for once. In a show that’s always bleak and depressing, it’s important to rally fans around something happy — like Joffrey Baratheon’s (Jack Gleeson) death in Season 4 — even if the feeling is only temporary.